The Walla Walla teens took their plan to the Alaska Airlines Imagine Tomorrow competition, an annual problem-solving challenge at Washington State University that encourages high school students to propose and present ideas that can impact sustainability on a local and global scale. Spread through the Compton Union Building ballrooms in late May, over 130 teams of professionally dressed high schoolers were eager to explain their projects, from the earthly—a community garden in La Center complete with biochar and biodiesel stations—to the skyward—envisioning space travel using algae as fuel. Detailed scale models, posters, and even a working smartphone app enhanced their innovative presentations. For nine years, the competition has drawn teens to WSU, where they present their ideas to judges from companies such as Boeing and Weyerhaeuser, the utility industry, and WSU faculty and graduate students. The top projects win cash prizes for the participants and their schools. Others receive awards for specific aspects such as global impact and most likely to succeed in the marketplace. The competition grew out of an idea by M. Grant Norton and several WSU colleagues about a decade ago. Norton, dean of the Honors College and a materials engineering professor, is cochair of the program with Boeing’s Terry Mutter. Over the years, the number of participants has swelled, and they come from all over Washington, Idaho, Oregon, and Montana. Several schools make Imagine Tomorrow part of their curriculum. Norton says half of the participants are female. That’s not lost on WSU’s Voiland College of Engineering and Architecture Dean Candis Claiborn. “It’s pretty cool, since that’s not the case in the industry. A lot of them are also from underrepresented groups,” she says. 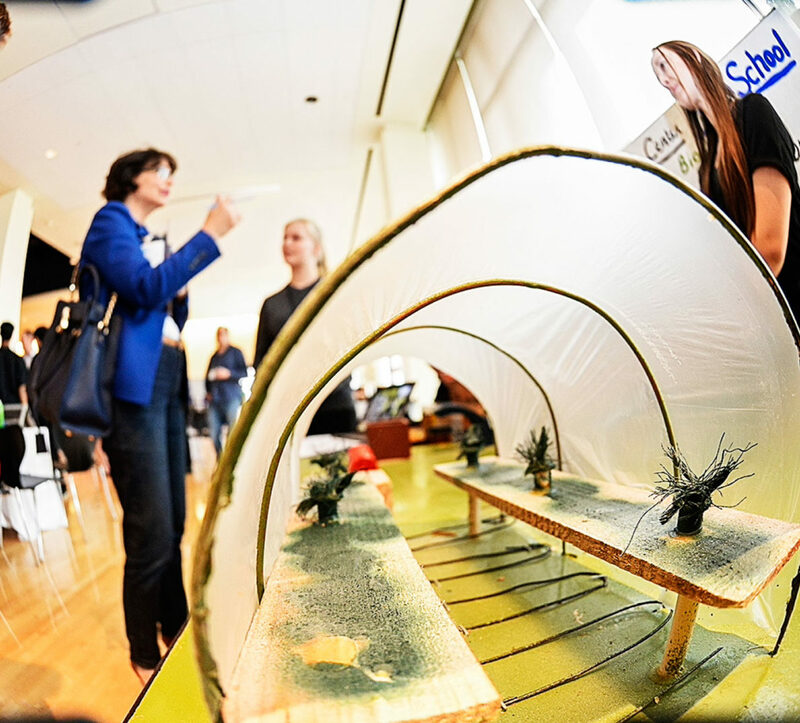 Imagine Tomorrow originally focused on energy, but this year the competition covered several topics: food, energy, and water; the Boeing aerospace challenge; the McKinstry built environment challenge; and the NARA biofuels challenge. NARA is a five-year, $40 million USDA bioenergy grant led by WSU. Students develop their projects within those four themes, using technology, design approaches, or ideas to change behaviors. Claiborn and Norton say the students benefit not only from their creative projects, but through increased confidence as they present to the judges. “This is like a real scientific conference and they become very polished,” says Claiborn. Imagine Tomorrow brought Hanna Raine ’15 into the engineering field. As a high school student from Blaine, Raine joined three consecutive Imagine Tomorrow competitions. One year, her team built a micro-hydropower generator using downspouts to generate electricity. “I loved talking to these adults who are experts in their field, and seeing them excited to talk to you, a 16- or 17-year-old,” says Raine. “It also taught me the experimentation process.” She earned her mechanical engineering degree from WSU and now works on Boeing’s 737 retrofitting program. As a judge for all nine competitions, Howard Wallace has been intrigued by how students apply their knowledge. He is a health physicist and radiation safety expert at Boeing and former high school physics teacher. “I’m looking for unusual applications or open-minded reexamination of old ideas,” says Wallace, pointing out a team’s plan to use zeppelins for cargo transport. Norton says sponsors such as Alaska Airlines, Boeing, and the utilities benefit from encouraging the high school students to not only consider a career in their industries, but to think broadly about solving problems. “These companies want to build connections to their communities and schools,” he says. 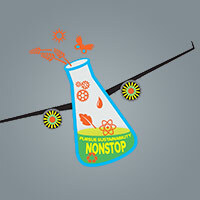 Whether they came from Caldwell, Idaho, with a design for a single-person, lightweight electric helicopter, or from Redmond’s Tesla High School with a smartphone game to simulate the benefits of biofuels, the high schoolers left with the knowledge that their ideas can shift the world toward a sustainable future. Many of the schools keep coming back—like Camas, Ballard, and Lake Roosevelt, which have sent teams to the Imagine Tomorrow competition every year. The teams want to improve on their projects, like the young women from Walla Walla, who plan to bring a working wastewater-recycling toilet to prove their concept next year.